Looking for a New Cadillac Escalade ESV in your area? CarGurus has 978 nationwide Cadillac Escalade ESV dealers with 12,797 new car listings. The Cadillac Escalade is already an imposing model in the luxury SUV class, but some people want something even more striking. This is where the 2018 Cadillac Escalade ESV fits in. 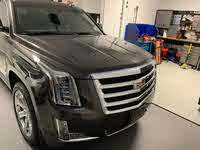 Cadillac adds 20 inches to the Escalade’s overall length and increases the wheelbase by 14 inches. The result is one of the biggest luxury SUVs on sale today. The ESV retains many of the design choices that make the standard Escalade standout. A massive front grille is flanked by large LED headlights that extend into the fenders. The side profile shows off minimal chrome trim and wheels range in size from 20 to 22-inches. Around the back are a long chrome bar splitting the tailgate and window and tall LED taillights. The Escalade ESV’s interior is a feast for the eyes with a modern design and the use of high-quality materials such as real wood trim. The top-line Platinum trim uses premium leather upholstery for the dash and seats to further elevate the experience. Passengers sitting in the front or second-row seats will have an abundance of head and legroom. The seats themselves offer excellent levels of comfort and support. Disappointingly, the added length of the ESV doesn’t help out those sitting in the third-row seats. Like the standard Escalade, the ESV’s third row is best reserved for children due to limited leg and shoulder room. 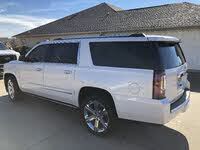 The added length primarily benefits the Escalade ESV’s cargo area. It offers a massive amount of space with 39.3 cubic feet behind the third row, 76.7 cubic feet behind the second row, and 120.9 cubic feet behind the front seats. The 2018 Escalade continues to come equipped with the older Cadillac User Experience (CUE) system housed in an 8-inch touchscreen. While CUE has seen various improvements in terms of performance and overall reliability, some consider the system’s touchscreen responsiveness delayed and interface unintuitive. On the upside, CUE does offer integration with Android Auto and Apple CarPlay, allowing owners to use the Bluetooth-enabled smartphone capabilities through the infotainment system. OnStar 4G LTE with Wi-Fi is standard on all Escalade ESV models. There is only one engine available for the Escalade ESV, a 6.2-liter 8-cylinder offering 420 horsepower and 460 pound-feet of torque. A new 10-speed automatic that was jointly developed by General Motors and Ford replaces the previous model year’s 8-speed automatic. Rear-wheel drive (RWD) is standard and a 4-wheel-drive (4WD) system is optional. Many reviewers love the 6.2 8 cylinder as it provides effortless acceleration and makes passing an easy affair. The 10-speed automatic is competent with quick and smooth shifting. Maximum towing figures stand at 8,100 pounds for RWD and 7,900 pounds for 4WD. Fuel economy figures for the 2018 Escalade ESV stand at 14 mpg city, 23 highway, and 17 combined for the RWD model and 14, 21, and 17 for the 4WD model. A number of writers say the Escalade ESV’s ride is less refined in the luxury SUV segment as a fair number of potholes are felt. This is surprising as the ESV comes standard with Cadillac’s Magnetic Ride Control (MRC). MRC also helps reduce body roll when cornering, making the ESV a surprising handler. The steering is nicely weighted and provides solid road feel. In terms of safety, the Escalade ESV has a 4-star overall rating from the National Highway Traffic Safety Administration (NHTSA). 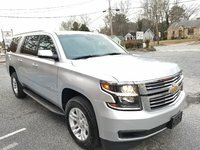 Standard equipment includes a large number of airbags, traction and stability control, parking sensors, rear seat reminder, surround view camera system, Teen Driver that allows a parent to set restrictions on speed and volume, and OnStar telematics. The Premium and higher trims add blind spot monitoring with rear-cross traffic alert, forward collision warning with automatic emergency braking, rear view camera mirror that provides an obstruction-free view of the back, and the safety alert seat that vibrates the driver’s seat to warn of possible damage. Premium Luxury and Platinum models get adaptive cruise control. Pricing for the 2018 Cadillac Escalade ESV ranges from $76,990 for the base RWD model to $99,090 for the 4WD Platinum. What's your take on the 2018 Cadillac Escalade ESV? Toddzilla16 The Cadillac vibrates way to much for a new vehicle let alone a Cadillac. We experienced horrible vibration while out on a test drive and the dealer thought it was a tire out of balance. It was not. GM has a horrible reputation for building garbage these days and not standing by it. Avoid them. Users ranked 2018 Cadillac Escalade ESV against other cars which they drove/owned. Each ranking was based on 9 categories. Here is the summary of top rankings. 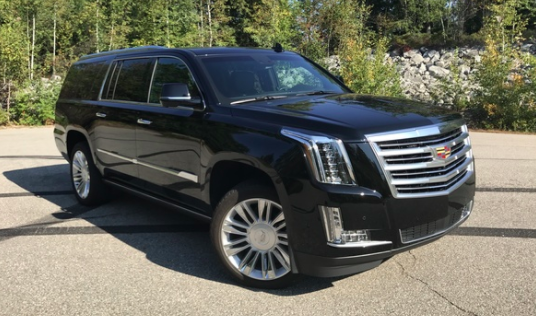 Have you driven a 2018 Cadillac Escalade ESV? Enter your zip to see incentives for a new Escalade ESV in your area.